Aprende’s No Cost Fundraising is an easy way to help earn money for our school. By simply linking your card, saving receipts, or giving business to our community we earn money for our students and teachers. Feel free to pass along Aprende’s Fundraising information to family and friends! ALL efforts are appreciated! Use AmazonSmile to make your purchases, and Aprende will receive 0.5% of your purchases! 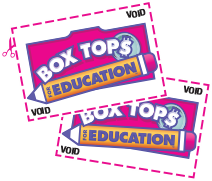 CLIP AND SAVE BOX TOPS FOR EDUCATION! The Aprende PTSO thanks you for your participation in the No-Cost Fundraisers!